On 30th April 2012, Ambassador Francesco Madeira, Special Representative for Counter-Terrorism and Director of the African Centre for the Study and Research on Terrorism (ACSRT), received Ambassador (ret.) James Larocco NESA Director, Ms. Anne Moisan, Associate Dean and Associate Professor and Mr. Lawrence Velte, Associate Professor and other staffers of Near East South Asia Centre for Strategic Studies. The visit was an invaluable opportunity to share perspectives on issues of mutual interest and to explore ways of co-operation between NESA and the African Centre for the Study and Research on Terrorism (ACSRT). 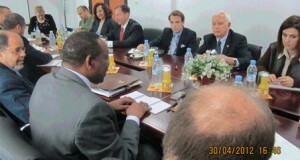 Ambassador Madeira briefed the delegation about the African Union instruments to counter terrorism, starting by the 1999 African Union Convention on the Prevention and Combating of Terrorism, the 2002 AU Plan of Action on the Prevention and Combating of Terrorism and the inauguration of the African Centre for the Study and Research on Terrorism (ACSRT) in 2004. 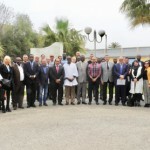 In this regard he outlined the strategic role of the ACSRT at the continental level in assisting Member States of the African Union to develop strategies for the prevention and combating terrorism; to develop methodologies for the collection, processing and dissemination of information; to organize workshops, seminars, symposia and training programs for capacity building of the Member States and regional mechanisms in the field of prevention and fight against terrorism in Africa and to develop programmes of cooperation and assistance with similar institutions at the national, regional and continental level, in terms of research, information collection and analysis of issues related to the prevention and the fight against terrorism. 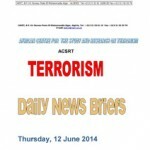 Ambassador Madeira also reviewed some of the ACSRT early warning tools such as an improved and user‐friendly version of Terrorism Daily News Highlight and Bi‐Weekly Press Review, which compiles articles on terrorist incidents that took place every fortnight. 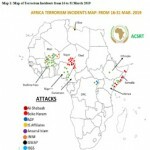 Furthermore, he talked about the ACSRT Database which covers various matters relating to the prevention and the fight against terrorism, particularly on terrorist groups and their activities in Africa. During the discussions, both sides insisted on their willingness to identify new areas of collaboration with a view to developing a co-operative program between NESA and ACSRT to help the African continent to fight against terrorism. 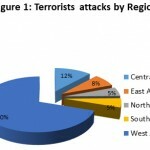 Concurrently, views were exchanged on the tremendous change and exciting developments throughout many African Countries, particularly in the Northern Africa region, with the beginning of the Arab Spring in North Africa as well as the successful democratic elections in Senegal and the critical situation in the Sahel region.